Well isn’t this a motley crew of small updates. In the past two weeks I’ve been mainly doing a little work here, some more over there and a tiny bit all the way over there. The updates are a bit difficult to stitch together into a coherent theme for a post, so I’m just going to list and itemize everything. It’s current behaviour has it wander aimlessly in the maze like the Wandering and Straying Spirits. 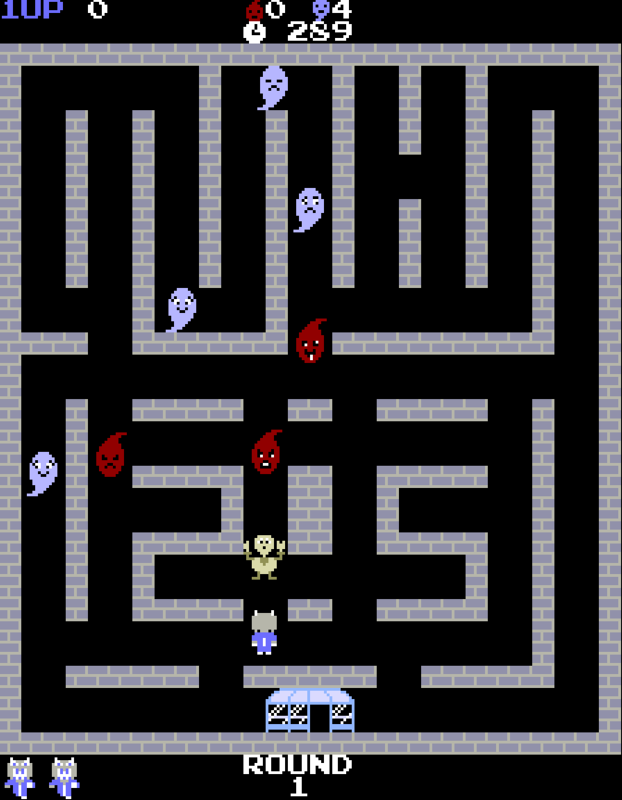 However, if there is an item in the maze, it will move towards, consume it and then resume wandering and feeling remorse. Also, you might kick yourself for not grabbing the item first. The Hungry Ghosts are harmful to touch at all times; they can be stunned or knocked out for a short period of time, but they cannot be captured, so they remain a permanent fixture in some rounds. Modified some of the rules for Pohena rounds: if Pohena comes into contact with a good spirit, her movement speed will be reduced until she is no longer touching one. They will slow her down enough for evil spirits or preta to catch up with and kill her. Hopefully (or disappointingly for Pohena) this will make good spirits more of an obstacle as evil spirits are for Donum. New music for Gonna Catcha: Bonus Round! Rewrote some of the graphical and garbage-collecting backend code. The new graphics code fixes some minor graphical glitches that occur when upscaling the game window. The rules section on the Gonna Catcha info page has been updated with the info in Item #2. The descriptions of the non-player characters from this post are now on their own page, with the addition of the two new spirit types and slightly updated artwork for the spirits. Rearranged some stuff on the sidebar on the right. ← Here comes a new challenger, and another one.